Hot off the press! Please join me for some great pottery, ice tea and more. Over 300 fans on Facebook! 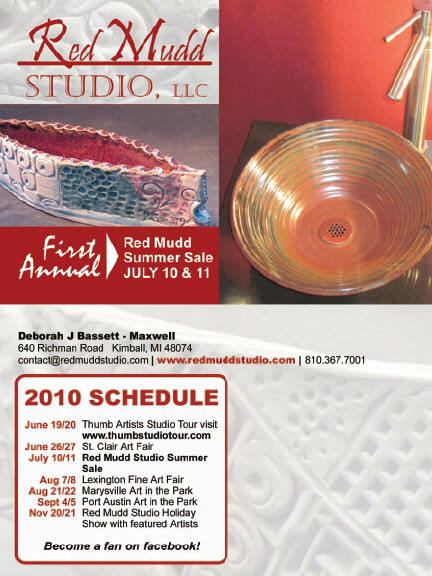 Thank you to each and everyone of you who has supported Red Mudd Studio in one way or another. I’m tickled pink to see the response here at the website and on Facebook. Leave me your name and snail address and you will receive a token of my appreciation. You can send your info to: contact@redmuddstudio.com. Hmmm… what’s going to happen if 500 fans join Facebook? Your comments and suggestions welcome.